The role of the Third Sector within European society is an extremely topical subject, as both governments and the EU continue to consider the role these organizations can play in providing essential public services. This book presents contemporary research into this emerging area, exploring the contribution of this important sector to European society as well as the key challenges that the sector and its components organizations face in making this contribution. 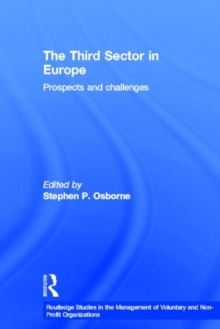 This volume brings together for the first time a range of challenging perspectives upon the role and import of the Third Sector for European society from a variety of disciplines - including economics, sociology, political science, management and public policy. Areas covered include the Third Sector civil society and democracy, relationships with government, its impact on social and public policy, the growth of social enterprise and of hybrid organizations as key elements of the sector and the future challenges for the sector in Europe.